I want to watch you cook this weekend. Can we make that happen? I'll buy the ingredients! Well far be it from me to refuse a baking-enabler! Done and done my friend! Within the hour we had a time, we had a plan, and we were ready embark upon the most epic baking adventure yet to grace the Eat Run Read kitchen. 6x6 and one of her co-workers knocked on my door late Saturday afternoon. They came bearing a bag of groceries: heavy cream, cream cheese, chocolate, etc. (all the most important things in life). They joined my roommates on my couch, opened a bag of chips, and settled in to observe an afternoon/evening of baking. And quite the process it was! This cake is not that difficult, it just has a lot of steps. But all the best things in life are worth the time, right? 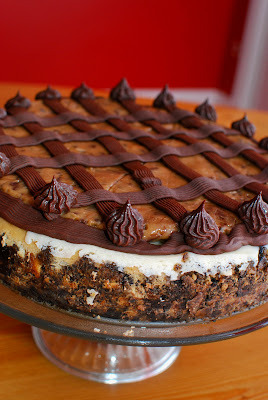 And yes, I do include this cheesecake as one of the best things in life. It may be the best thing I have ever made. It's definitely the prettiest. I only slightly modified the recipe. I didn't have enough oreos, so I did half oreo, half crushed graham crackers for the crust. 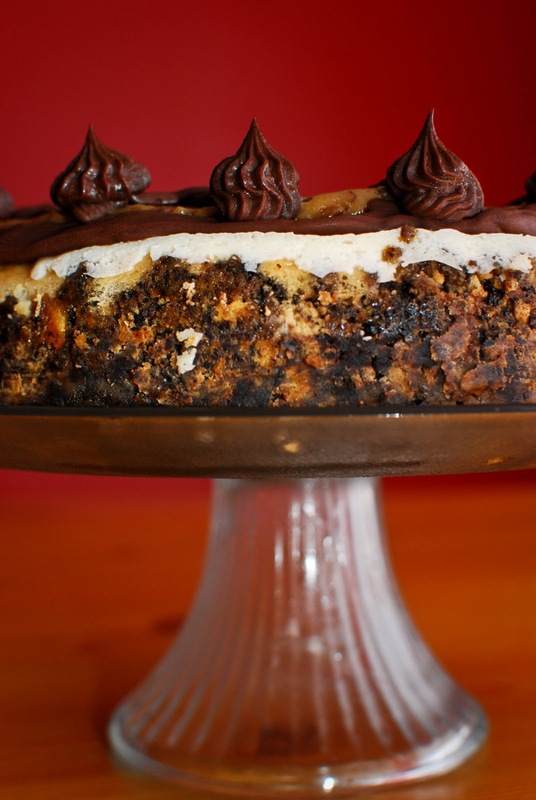 This cake's only flaw was that the crust came out soggy. (Ugh, why is crust always so difficult?) 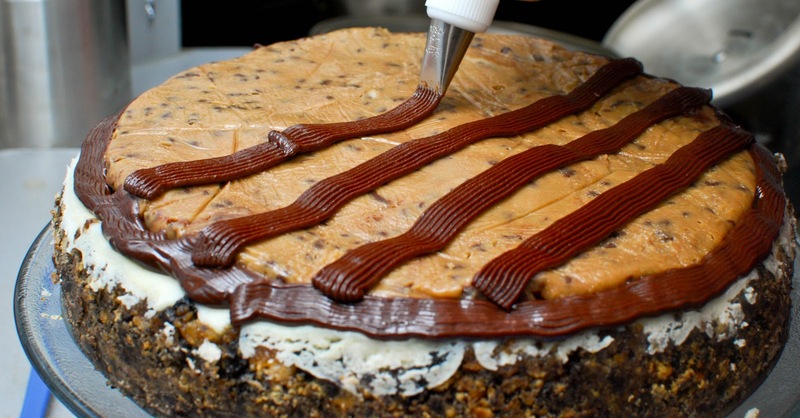 I suggest baking the crust for 10 minutes before adding the ganache. 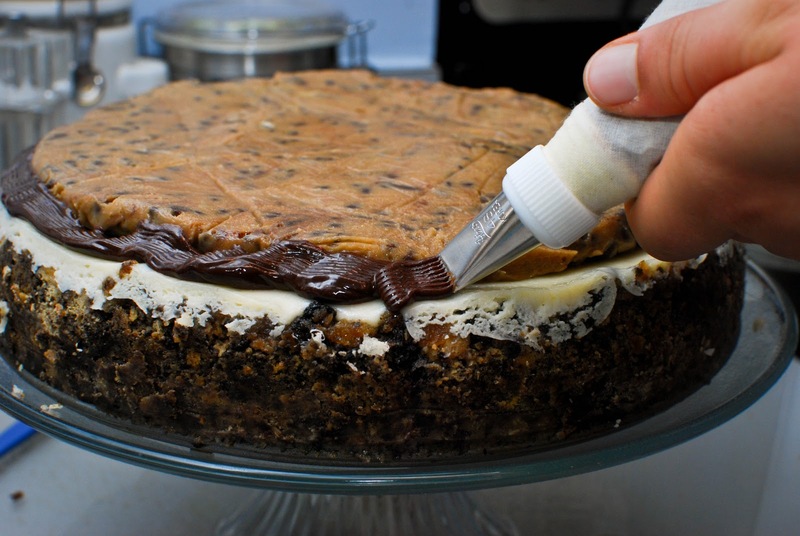 And also, when you take the cake out of the oven, immediately unwrap the foil and cool the cake on a cookie rack. 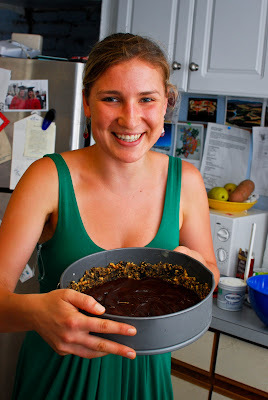 Also, this recipe made way too much ganache. 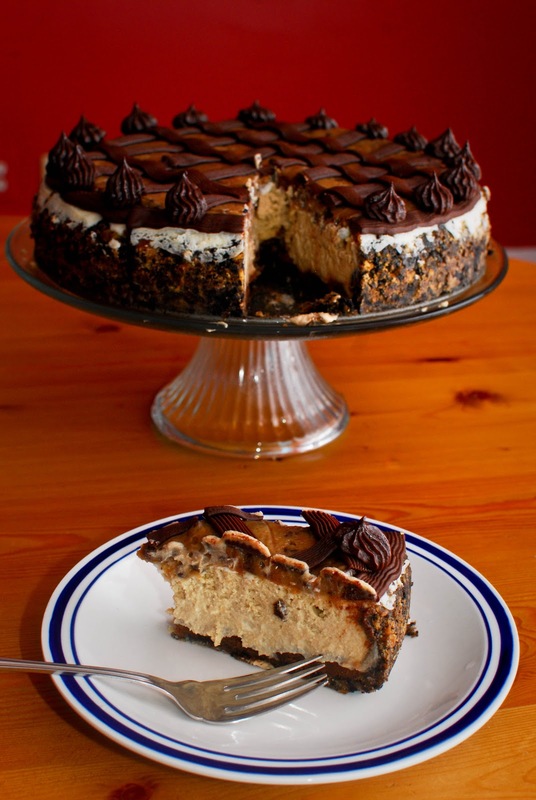 We're talking twice the ganache you need. Not that I'm really complaining. (Yummmmm extra gnache in my fridge! Graham crackers, meet ganache. 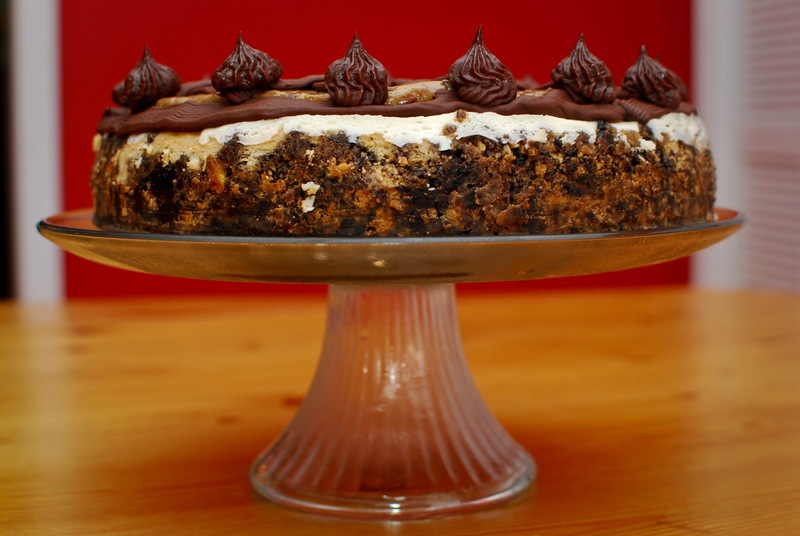 Apples, meet ganache. My fingers, meet ganache!) 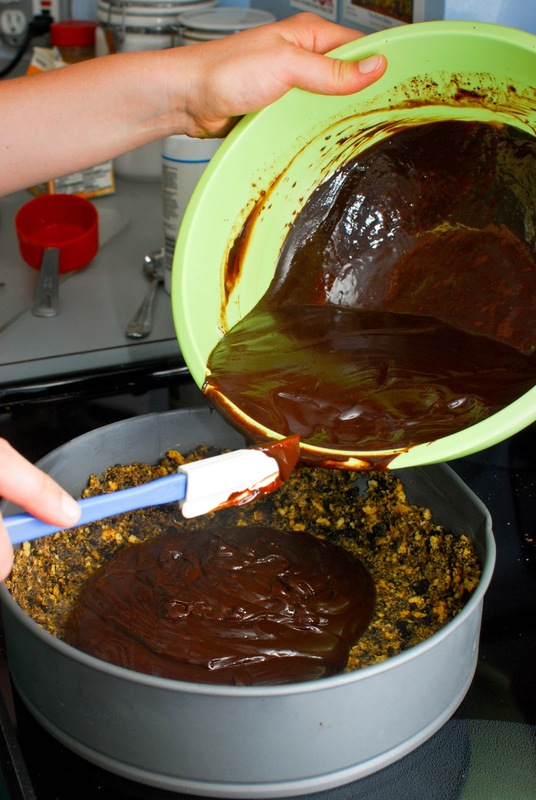 But if you want to avoid that chocolatey temptation, half the ganache recipe. 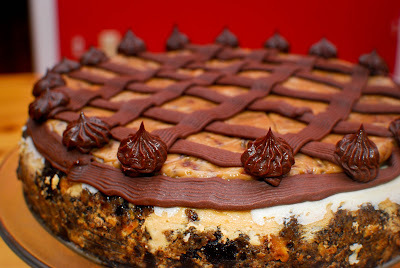 I made the crust, ganache, cheesecake, sour cream, and cookie dough on Saturday. Then on Sunday I assembled. 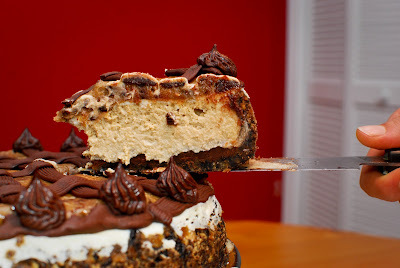 I laid the cookie dough on top of the cheesecake, and re-heated my ganache (in the microwave) to decorate. Then everyone (6x6, roommates, friends, etc.) 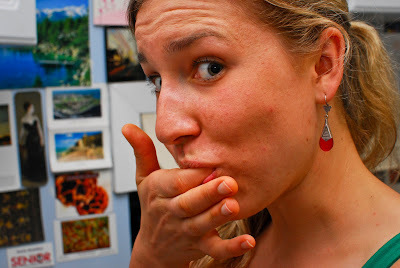 ate. Oh. My. Goodness. Like I said, best cake ever. 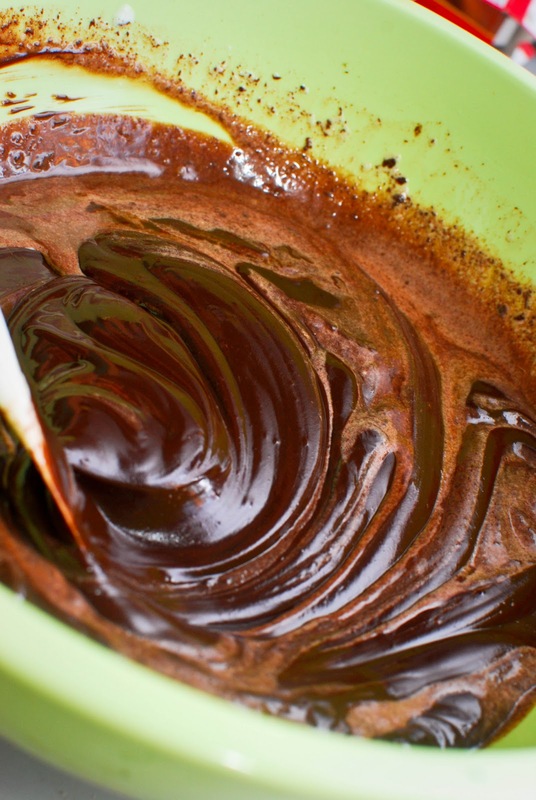 Pour 1.5-2 cups of the ganache over the bottom of the crust. Freeze until the ganache layer is firm, about 30 minutes. Reserve the remaining ganache; cover and let stand at room temperature for later decorating. 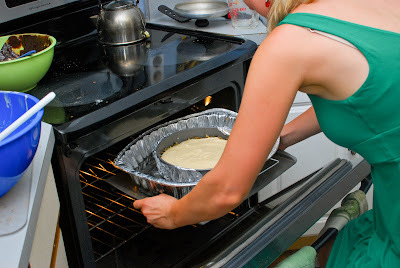 Preheat the oven to 350˚ F and position a rack in the middle of the oven. In the bowl of an electric mixer fitted with the paddle attachment, beat the cream cheese and sugar on medium-high speed until well blended. Beat in the flour. 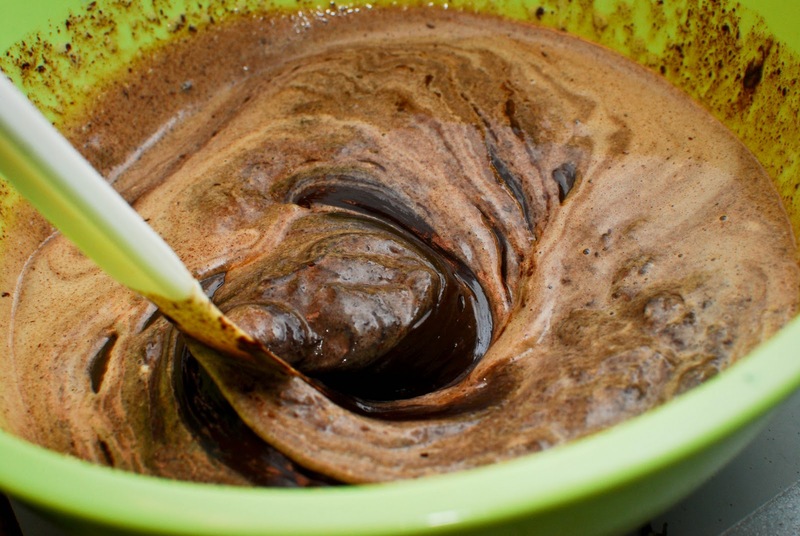 In a small bowl, combine the coffee granules, vanilla and molasses, stirring until the coffee dissolves. 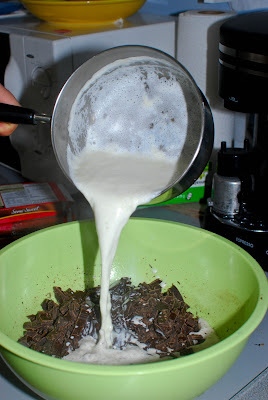 Add to the cream cheese mixture and beat until well incorporated, scraping down the sides of the bowl as needed. Beat in the eggs one at a time, scraping down the bowl between each addition. 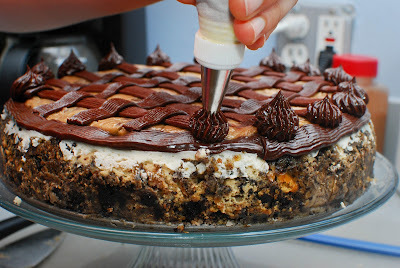 Pour the filling over the cold ganache in the crust. 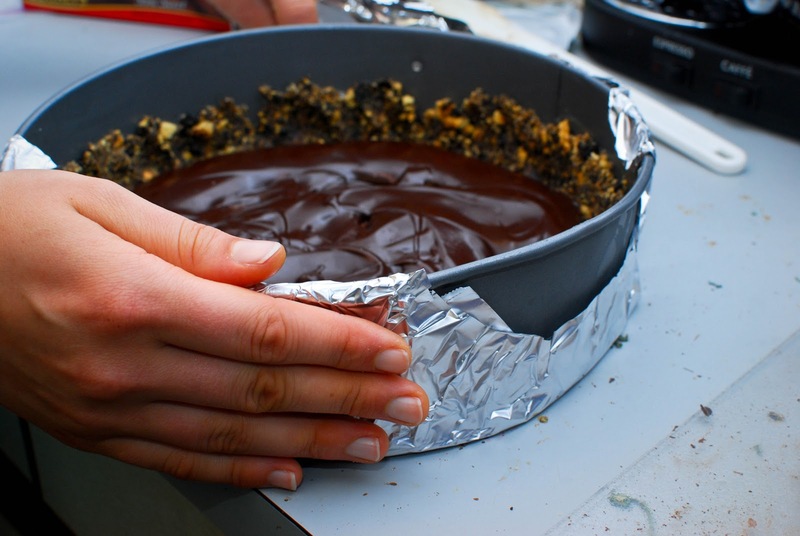 Enclose the bottom of the springform pan in tightly wrapped foil and place it in a baking dish. Fill the baking dish with hot water about halfway up the cheesecake pan, careful not to let the moisture touch the cheesecake. 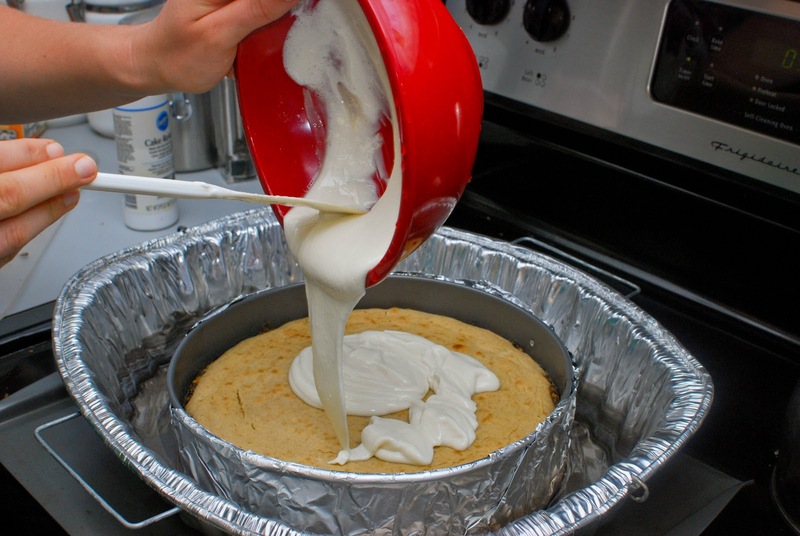 To make the topping, whisk together the sour cream, sugar and vanilla in a small bowl. Pour the topping over the hot cheesecake, spreading to cover the filling completely. 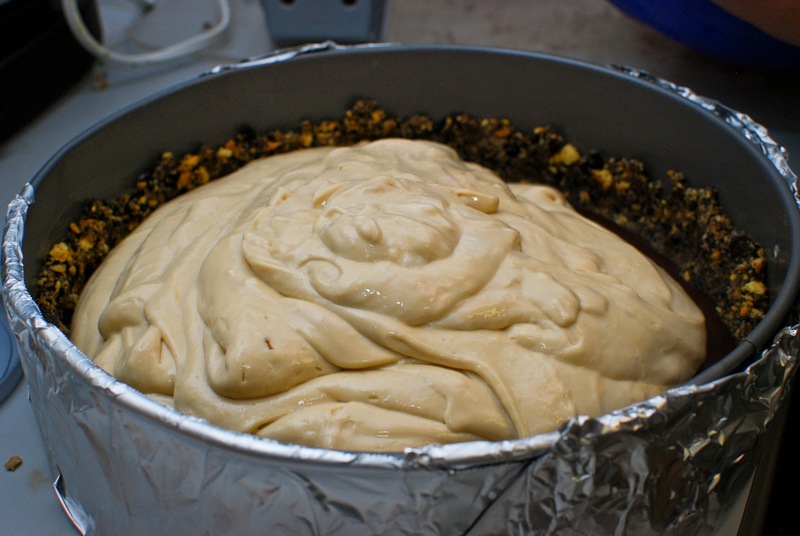 Bake until the topping is set, about 10-15 minutes. 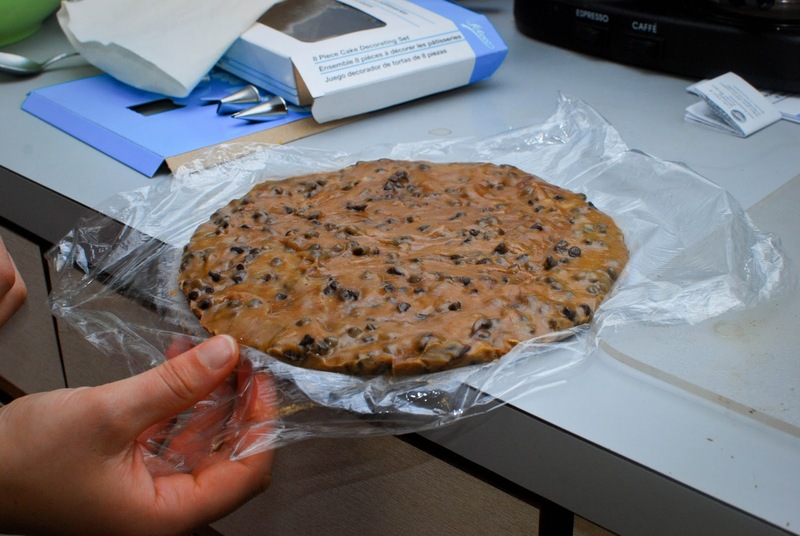 Return to the cooling rack and let cool at room temperature for at least 30 minutes. Transfer to the refrigerator and let cool at least 3 hours, until completely chilled and set. 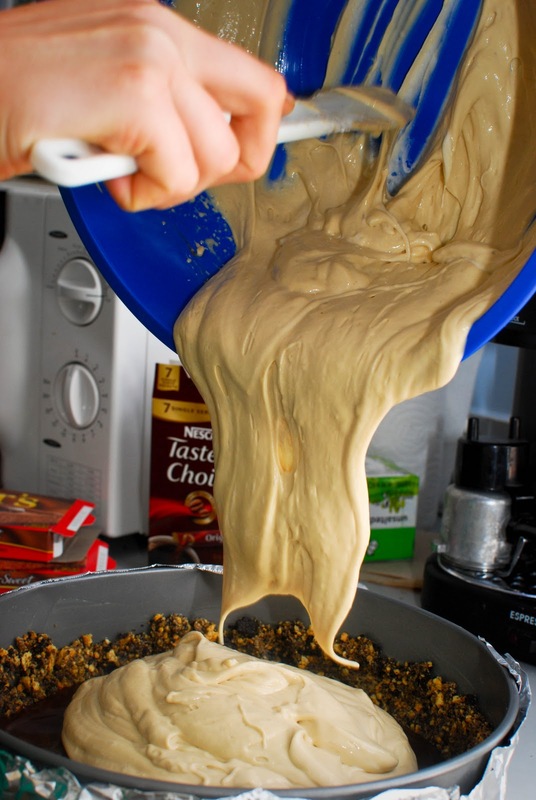 To make cookie dough layer, cream together the butter and sugar in a large bowl. Stir in the flour, salt, vanilla and chips. 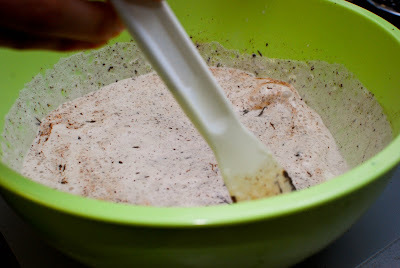 Add the water, one tablespoon at a time, until you have reached a cookie dough consistency. 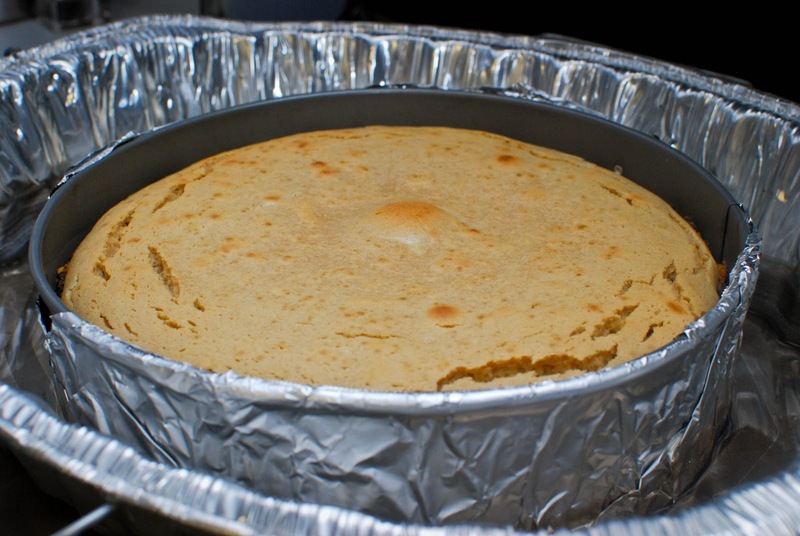 Line a 9-inch cake pan with parchment paper (I used plastic wrap). Spoon the cookie dough into the pan and flatten to an even layer. Freeze the cookie dough layer until ready to use, at least 30 minutes (I let it freeze overnight and then assembled the cake the next day). To finish, wrap a warm towel around the outside of the springform pan to help loosen the crust from the sides (Or just run a sharp knife around the outside). Carefully remove the springform. 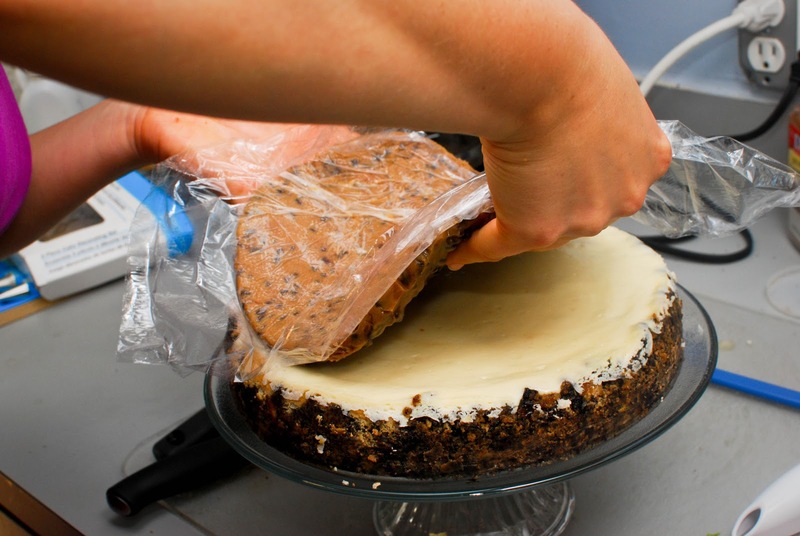 Transfer the cake to a serving platter. 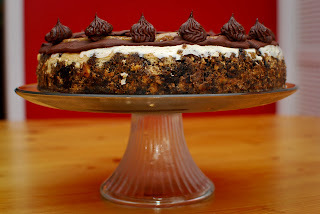 Turn cookie dough out of cake pan and place layer on top of cheesecake, pressing it gently into place. 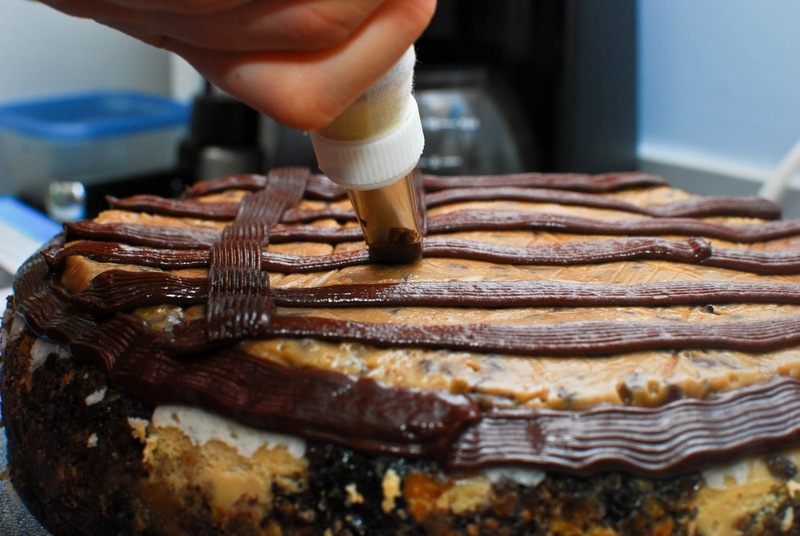 Place the reserved ganache in a pastry bag fitted with a decorative tip and use to garnish the top of the cake as desired. Chill until the ganache is completely firm. When you cut into this cheesecake, I suggest running your knife under hot water before every cut. Oh man. Seriously. Best thing ever. There are a lot of components, but it really doesn't seem like too much when you're eating it. 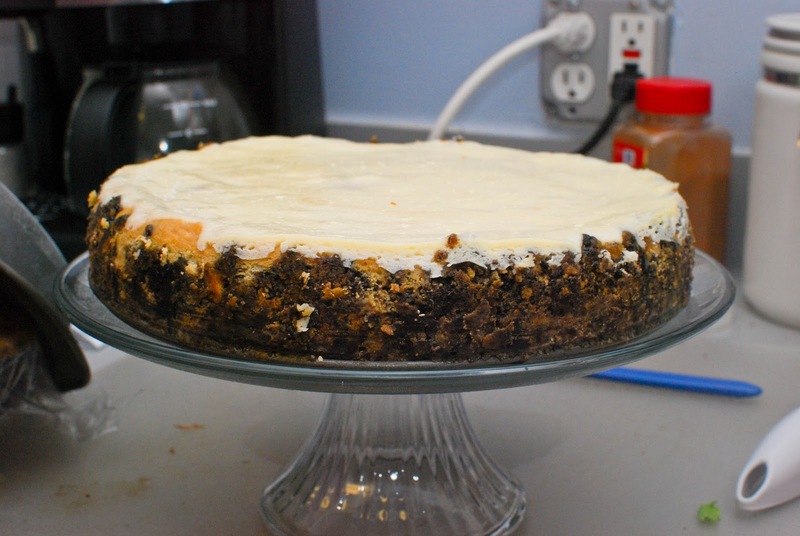 The cheesecake itself is the best cheesecake I've made (I think thanks to the water-bath cooking process). 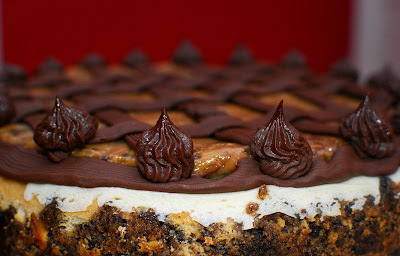 And the ganache and cookie dough. I mean, yes. 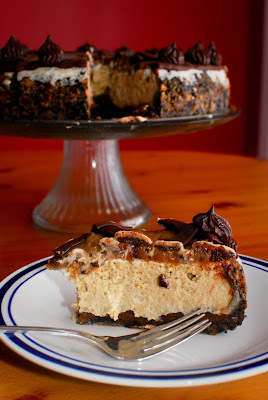 I can't claim that this cheesecake is me in cake form (like Jess said). More like this cheesecake is what I want to be when I grow up. In cake form.